At DAV Public School our endeavor is to provide children with an educational experience that encourages a culture of excellence and an appreciation of values, in an environment that fosters the joy of learning. We constantly strive to achieve this by following the best practices in education and on the strength of a dedicated team of faculty. Children's all-round development, our outstanding results across all the curricula and the placement of our graduates in the world's top universities, year after year, are a reflection of this commitment. 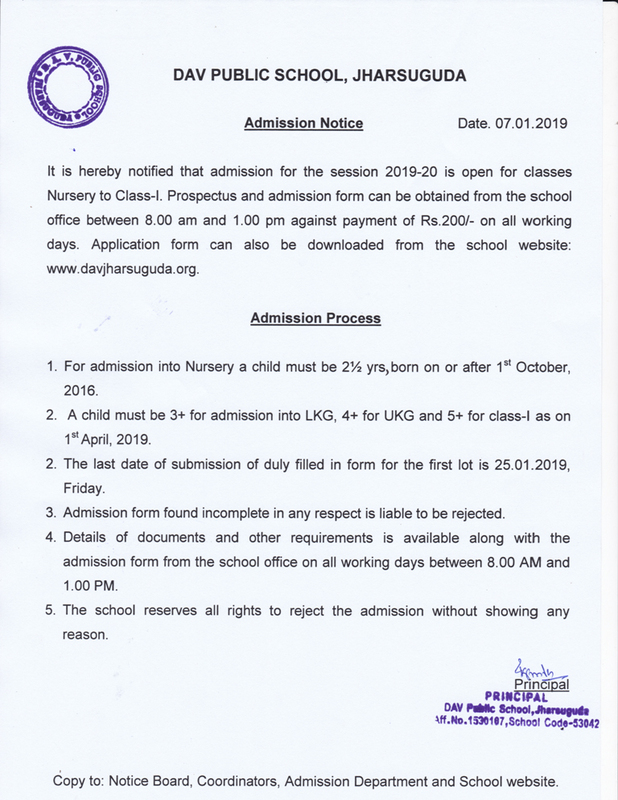 Age of a child must be 2.5+ yrs for Nursery as on 01.04.2019. Age of a child must be 3+ yrs for LKG as on 01.04.2019. Age of child must be 4+ yrs for UKG and 5+ yrs for Std I and accordingly for other classes as on 01.04.2019. Three nos. of coloured passport / stamp size photograph. Photo copy of Birth Certificate. Money Receipt of Admission Form. Self attested copy of Adhar Card of the child (Not compulsory). Self attested copy of blood group of the child. Photo Copy of Report Card / Marksheet. Self attested copy of Adhar Card of both father and mother (Not compulsory). Self attested copy of vaccination card of the child. Copy of T.C. from the school last attened. Self attested copy of Caste certificate ( in case of SC/ST/SEBC only). Self attested copy of BPL card ( In case of BPL Card holders only). Self attested copy of Residential Certificate ( for SC/ST/SEBC/BPL card holders). The Parents (Father & Mother both) alongwith the child must be present at the time of counseling. The Certificates in ORIGINAL, whichever is applicable to you, must be produced at the time of admission.